WASHINGTON, Oct. 3, 2014 /PRNewswire-USNewswire/ — Rached Ghannouchi, the leader of Tunisia’s Ennahdha (Renaissance) Party, visited the U.S. this week to urge lawmakers to publicly support democracy as Tunisia heads for Parliamentary elections on October 26. As the first, post-revolution Arab Spring country to conduct what are expected to be free and fair elections, Tunisia offers a sharp contrast to the region’s extremes. Ghannouchi was invited to speak at Yale University in Connecticut and Columbia University in New York, and also addressed the U.S. Institute of Peace in Washington, DC this week. He reiterated that Tunisia’s consensus-based model will showcase that Islam and democracy can co-exist in the Arab world. “One flower cannot make the spring,” Ghannouchi told a small group of reporters at the US Institute of Peace at the start of a visit to the United States during which he will also meet key US administration officials. Ennahda last week unveiled an ambitious platform for the parliamentary elections, saying it was confident of a greater victory than the one achieved three years ago. “By the end of this year we can guarantee that Tunisia will be the first Arab democracy,” Ghannouchi said, speaking in English. “But we need the support of the United States for this experience, which can be considered as the alternative of extremism and terrorism and war,” he said. “There is a part of the Middle East (where) there is a candle still shining,” he said. Ennahda rejects any form of what he called “terrorism,” but Ghannouchi insisted that to fight groups such as Al-Qaeda and the Islamic State group, a program of social justice was needed to ensure there was food on the table and jobs. 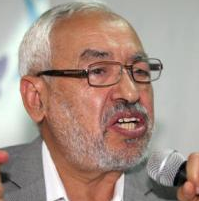 Despite his claim that Ennahda rejects any form of terrorism, in May 2013, the GMBDW reported that Mr. Ghannouchi had called for young people to realize that “Jihad belongs in Palestine.” In 2011, Mr. Ghannouchi gave an Arabic-language interview in which he predicted the end of Israel, a viewpoint which is not surprising given that he has had a long history of ties to Palestinian extremism and calls for terrorism. In February 2009, Mr. Ghannouchi was a signatory to the so-called Istanbul declaration that called for the opening of a “third jihadist front” against Israel. 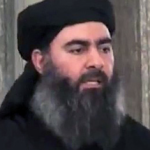 The statement was the result of a conference held under the auspices of the Global Anti-Aggression Campaign (GAAC), an international Islamist umbrella group comprised of Islamist scholars tied to the Global Muslim Brotherhood as well as Salafi-Jihadi scholars including individuals designated as terrorists by the US government.